Coleraine face a testing trip to face Championship One leaders Ards in Tuesday's League Cup semi-final. The Bannsiders have lost their last two Premiership matches and will be without suspended skipper Howard Beverland. Warrenpoint Town, without a point in 13 league games, host holders Cliftonville in the night's other tie at Milltown. Meanwhile Linfield are at home to Carrick Rangers in a rearranged County Antrim Shield semi-final, which has been moved from Taylor's Avenue. Gary Haveron's side had been scheduled to enjoy home advantage but the venue was switched because of the ongoing problems with the pitch at the Belfast Loughshore Arena. "This is now a massive game for us and I am looking for players to stand up and be counted," said Linfield manager David Healy after his side were held to a 1-1 draw by 10-man Ballinamallard on Saturday. "We don't have enough players scoring goals and we are relying too heavily on Andy Waterworth in that regard," lamented the Blues boss. The winners will face Ballymena United in the final on Tuesday 12 January. Coleraine manager Oran Kearney believes Ards, who saw off the Mallards after a penalty shoot-out in the quarter-finals, will provide tough opposition at Bangor. "Ards are flying high in the Championship and have a lot of players who have played Irish League football at the top level. It will be difficult for us, especially away from home," observed Kearney. "We reached a League Cup final in my first full season in charge but under-performed against Crusaders in the final so I'm keen to get back to a final and make amends," added the former Linfield and Ballymena United midfielder. Warrenpoint have Stephen Moan sitting out their game against Cliftonville through suspension, following his dismissal in the 4-2 defeat by Ballymena United. "It is a welcome distraction for us to be playing for a place in a cup final and we are looking forward to it," commented beleaguered Warrenpoint boss Barry Gray. "Cliftonville are a formidable side but this is the first time that our club has been involved in a senior cup semi-final and we will give it everything we have," added the Town manager. 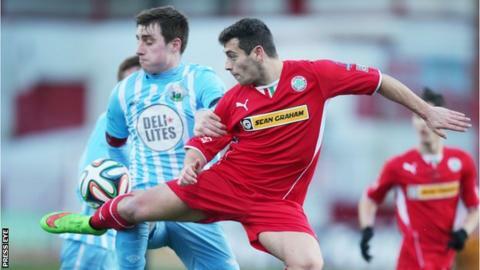 In contrast, the Reds are aiming to win the trophy for the fourth consecutive season, having defeated Crusaders twice and Ballymena once in the last three finals of the competition. There will be coverage of all the night's action on a Sportsound Special on BBC Radio Ulster medium wave and the BBC Sport website from 19:30 GMT on Tuesday 15 December.